Author J.S. 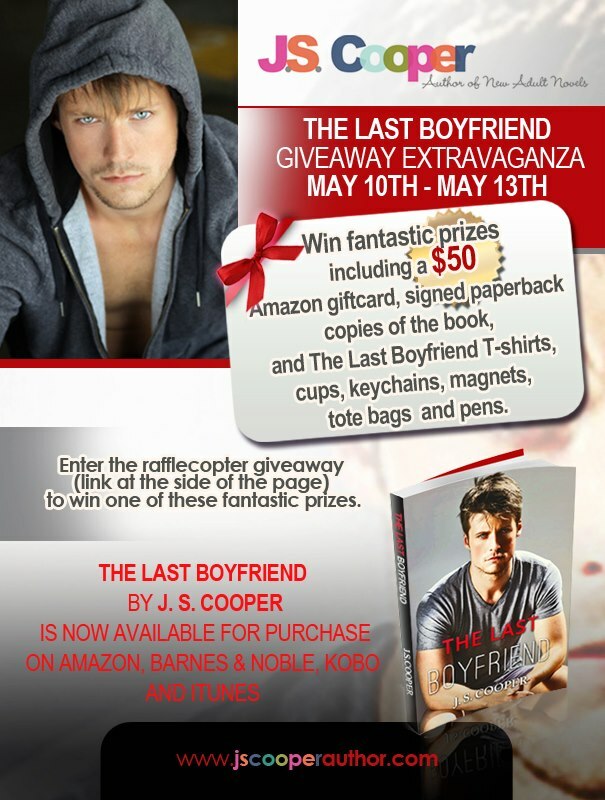 Cooper is having an AWESOME giveaway in celebration of the release of her newest book, The Last Boyfriend. Lucky Morgan has had her share of heartbreak. She is devastated when her boyfriend dumps her after sleeping with him and she vows to herself that she won't be used again. She decides that the next guy she dates and sleeps with, will be her one true love. Zane Beaumont is the mysterious and snooty guy that comes into her diner every Friday night with a different girl. He's the type of guy she's learned to avoid: carefree, fast, handsome, rich, and sarcastic. Unfortunately, she can't stop thinking about the devilish gleam in his eyes. When Lucky's car breaks down one night after a party, it is Zane who comes to her rescue. As Zane attempts to sweep Lucky off of her feet, she soon realizes that nothing is as it seems and that Zane may very well be the guy for whom she changes the rules. That is until she meets Braydon. New Adult Contemporary Romance **Mature Content** Recommended for ages 17+ due to sexual situations and language.